American-made Black Eagle Tomahawk Axes are designed for sportsmen and military professionals. The lightweight design makes it easy to carry and with Estwing’s Shock Reduction Grip for comfort and durability. Black Eagle tools are perfectly balanced and weighted, and made to last. American forged in one piece out of genuine American steel. To start, what is a tomahawk? The simple answer is a general purpose hand axe originally from North America that closely resembles a hatchet, but with a straight shaft instead of an angled one. Tomahawks were used by Native Americans and European colonials alike, and often employed as a hand-to-hand or a thrown weapon. Metal tomahawk heads were forged and originally based on a Royal Navy boarding axe. Of course, there are many different kinds of tomahawks, from traditional forged hawks to those designed for modern tactical and close-combat applications, and even tomahawks designed specifically for throwing. Estwing’s Tomahawk does not come with in any packaging so when I opened the box that it was shipped in, there it was waiting for me to pick it up. From end to end, the Black Eagle model that I have is black on black, but they are also available in blue with a blue grip and black with a leather grip. The Black Eagle Tomahawk is forged right here in America from a solid slab of American-made 1055 high carbon steel for its incredible strength and durability without being too brittle, making it virtually indestructible and built to last. It is coated with a tough powder-coating in flat black to help prevent rust and corrosion. The axehead is nearly 7.25″ long with a spiked point at one end and a sharpened blade with an extremely sharp edge nearly 2.5″ wide at the other. The entire hawk is just over 1/4″ thick with an overall length of 16.25″. At a little less than 27 ounces, the Black Eagle Tomahawk is a well-balanced wicked chopper. The black powder-coated handle design encapsulates the tang consistent with most of Estwing’s hammer line with their patented nylon vinyl shock-reduction grip providing a slight tackiness for an excellent traction, even in wet conditions. The handle is designed to be extremely comfortable to wield for extended periods of time and absorb an incredible amount of shock thereby reducing injury and fatigue. The sheath provided with the tomahawk is made from a tough plastic-lined nylon fabric, reinforced with nylon webbed tape, stitched and riveted seams. The tomahawk is held firmly in place with a button and two button straps. The nylon web belt loop is double-stitched onto the back of the sheath capable of supporting up to a 2.25″ belt. For those who prefer, there are rugged third-party kydex sheaths available as well. 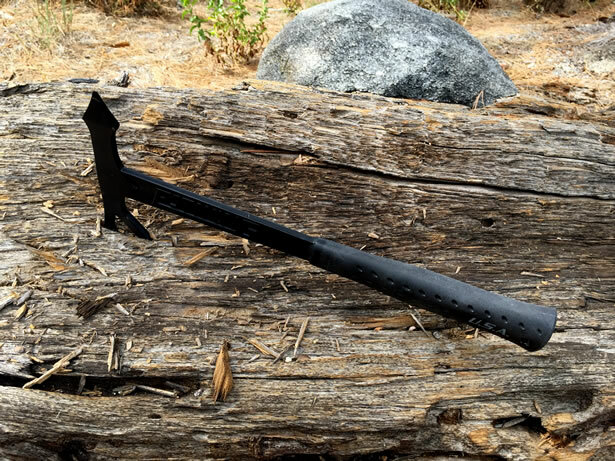 Now lets see what the Black Eagle Tomahawk can do… In order to provide a some sort of apples-to-apples comparison between tomahawks, I will be performing four durability and usability tests; Chopping, Penetrating and Breaking and Edge/Point Retention. In a real survival situation, all resources are fair game. However, since I am not in a life-or-death situation, I’ll stick to working some seasoned logs and concrete blocks that I have lying around for these tests. I thoroughly recommend wearing eye protection and a good pair of gloves to protect your hands and absorb some of the vibration. To test the ruggedness of the tomahawk and its sharpened blade while chopping, I used a log approximately 6″ in diameter that has been sitting around for quite a while so it was not at all green. I felt that it would be a good demonstration of its ability as a chopper. The proper method of chopping, or bucking a log is to strike the log at a 45° angle from two perpendicular directions along the cut-line, effectively making a “V” in the material used. This is otherwise known as the kerf. The kerf should equal the diameter of the trunk, and when cutting from both sides, the kerf would essentially be half the diameter. At 27 ounces, the hawk is certainly light enough to move fast and without causing much fatigue, but also heavy enough to provide ample force with each strike driving the sharpened edge deep into the material that I was chopping. I continued to hack my way around the log and the wood chips were flying, and I didn’t have to work very hard at it. However, a heavier axehead with a broader edge and an aggressive belly would have been much more efficient at chopping like that of a traditional axe or hatchet. For this test, I wanted to simulate having to get through a car door or steel building. To do so, I used the tomahawk to penetrate a heavy-duty 20-gauge steel panel with both ends of the axehead. Really… I just wanted to make some holes in a steel panel that I had lying around. With the first swing, I punched the spiked point right through the panel like it was cardboard as did the five other swings. Then I flipped to the blade-side of the tomahawk. First, I tried striking the panel straight on and the blade did nothing more than dent the panel a little so the next time I tried striking the panel with the upper-edge of the blade first, and the tomahawk at a steep angle, the blade cut right through the panel. I tried this a few more times just making holes before cutting a 12″ slit down the panel. 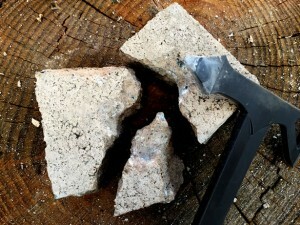 I started off breaking up a couple of cinder blocks up with the spiked point and found that they offered little resistance. It literally took less than one minute to break both of them them up into small pieces no larger than a tennis ball. The material they are made from is just too thin and brittle to offer a any challenge to this tomahawk. After some looking around, I decided to step it up a bit and beat on some tough bricks that were nearly 3″ thick. I started beating on the first one with the spiked point until it broke. It actually took four hard swings before it split into three pieces. I finally found a tough material that offered some resistance. As a result, the very tip of the spike rolled a little. But not so much that the tip couldn’t be repaired with a few quick passes of a metal file. After close inspection of the blade, there were no chips or cracks along the edge. However, the edge was definitely dulled in some areas and had some slight rolling in others. As for the point, I experienced the same… No chips or cracks, just a slight rolling of the tip. Nothing more than I was expecting and easily remedied with a file or sharpening solution. Estwing’s Black Eagle Tomahawk is a rugged tactical hawk designed for medium-duty demolition, excavation and extraction applications in an urban setting including close-quarter hand-to-hand combat situations. It is well-balanced and easy to wield so it is not overly fatiguing. I would consider this tomahawk somewhere in between an ultra-light fast combat hawk and a heavy-duty tactical demolition hawk. At about $40, the Black Eagle Tomahawk is a pretty good deal for what you get. But it is not without issue. I would have preferred a broad-bellied blade myself, and I think it would be better if the warning message that is moulded into the side of the handle was not as coarse. 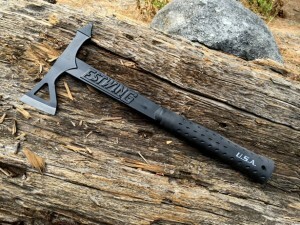 Estwing continues to innovate and produce new hand tools. Our engineers work continually to create the most revolutionary and long lasting hand tools on the market. 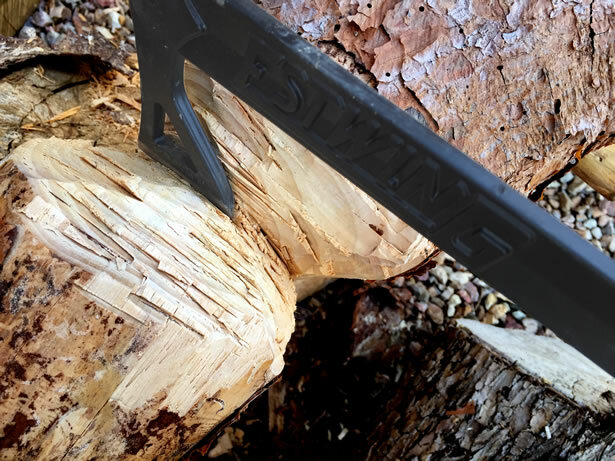 Estwing is committed to American made tools for today and tomorrow.